People rushed to banks and queued at cash machines that refused to release cash as resentment quickly set in. The savers, half of whom are thought to be non-resident Russians, will raise almost €6bn thanks to a deal reached by European partners and the International Monetary Fund (IMF). It is the first time a bailout has included such a measure and Cyprus is the fifth country after Greece, the Republic of Ireland, Portugal and Spain to turn to the eurozone for financial help during the region’s debt crisis. The move in the eurozone’s third smallest economy could have repercussions for financially overstretched bigger economies such as Spain and Italy. People with less than 100,000 euros in their accounts will have to pay a one-time tax of 6.75%, Eurozone officials said, while those with greater sums will lose 9.9%. 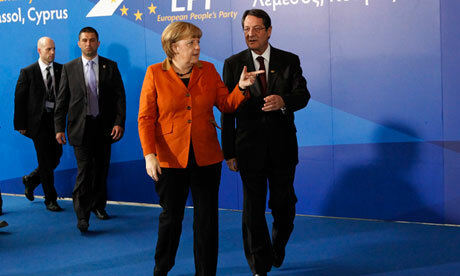 Without a rescue, president Nicos Anastasiades said Cyprus would default and threaten to unravel investor confidence in the eurozone. The Cypriot leader, who was elected last month on a promise to tackle the country’s debt crisis, will make a statement to the nation on Sunday. She said a lot of elderly Britons had transferred savings to the island when they had decided to retire there. “Nobody can understand how they can do this – isn’t it illegal? How can they just dock money from your account?” she asked. Maria Zembyla, from Nicosia, said the levy would make a “big dent” in her family’s savings and “erode the investor confidence”. “It is robbery. People like us have been working for years, saving to pay for our children’s studies and pensions and suddenly they steal a big share of this money. Russians that currently keep the economy afloat will leave the country along with their money,” she added. The levy does not take effect until Tuesday, following a public holiday, but action is being taken to control electronic money transfers over the weekend. Co-operative banks, the only ones open in Cyprus on a Saturday, closed following a run on the credit societies while ATMs cancelled transactions due to “technical issues”. Depositors started queuing early to withdraw their cash, and protestors gathered outside the presidential palace. “I’m extremely angry. I worked years and years to get it together and now I am losing it on the say-so of the Dutch and the Germans,” said British-Cypriot Andy Georgiou, 54, who returned to Cyprus in mid-2012 with his savings.